Dimensions: Pear: 3 1/14" x 1" diameter: Apple: 3 1/14" x 1 1/3" diameter; Place-card: 1 2/5" x 2 4/9"
These place card holders features a double stack of suitcases in pink and blue, and come with coordinating white place cards with gold foil details. 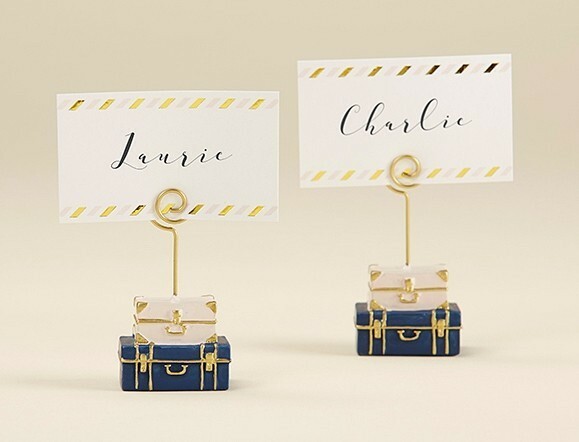 For bridal showers, destination weddings, and travel-themed engagement parties, each suitcase place card holder is a useful and memorable guest gift! Each place card holder has a gold-colored-metal wire spiral on top to hold the place card. Non-personalized (the pictured calligraphy is an example of what you can write on the cards). PLEASE NOTE: Sold as a set of six (6) and prices quoted below are per set.